Moe Satt, Collective memories from 88 uprising, 2018. Moe Satt, Other side of the revolution, 2018. Moe Satt, Bo/Kyar/Thanat, 2018. Courtesy of the artist. With one of the most buzzed about and appreciated presentations at this year’s Art Basel Hong Kong, Moe Satt’s compelling and politically engaged practice warrants an in depth exploration. Here, we deconstruct the conceptual implications of his works, and discover why their significance is so relevant today. Most of Moe Satt’s works derive inspiration from recent Burmese historical events. The artist has been exploring the specific time period of 1983 to 2005, which spans the time from when he was born in Yangon, to when he started practicing art by doing performances right after his graduation (with a degree in zoology). Last year, Myanmar celebrated the 30th anniversary of the student-led uprising of 1988 – known as the 8888 Uprising – Satt decided to focus on this historical event, and in doing so, he raised questions about how these protests are assessed today. 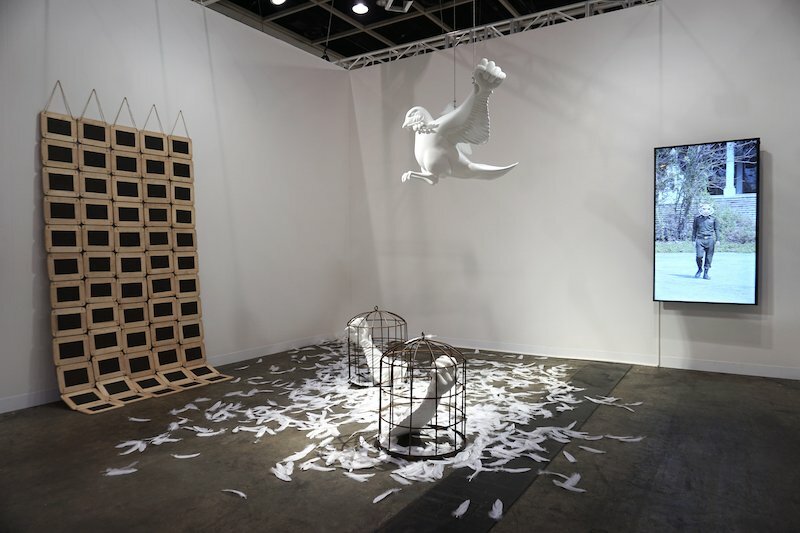 The trio of works presented by Nova Contemporary during Art Basel Hong Kong 2019 followed the artist’s solo exhibition, If I say it’s True Seven Times, which responded to these events. The show, which took place in Yangon in August 2018 at Myanm/art, reflected the multiplicity and fragmentation of historical perceptions. Interpreted in various mediums from installations to photographs to video animation, the show addressed the event from both personal and collective perspectives. In 1988, the protests aimed to overthrow the power of the dictatorship established in 1962 by General Ne Win. These were violently repressed, and a bloody putsch installed a military junta which held on to power until 2011. Satt does not wish to emphasize the violence of the events through his artworks, but rather to highlight the determination of the protestors, simaltaneously mocking politics and pointing at its absurdities. Times have changed: there is now a small museum dedicated to the uprisings where Satt found archival material, including newspapers such as The Call, that were self-published during the protests. He was struck by the symbolic power of one of the covers, which shows a dove with clenched fists as wings. Satt met the designer of this logo and reappropriated it by turning it into a ceramic and fiberglass installation. 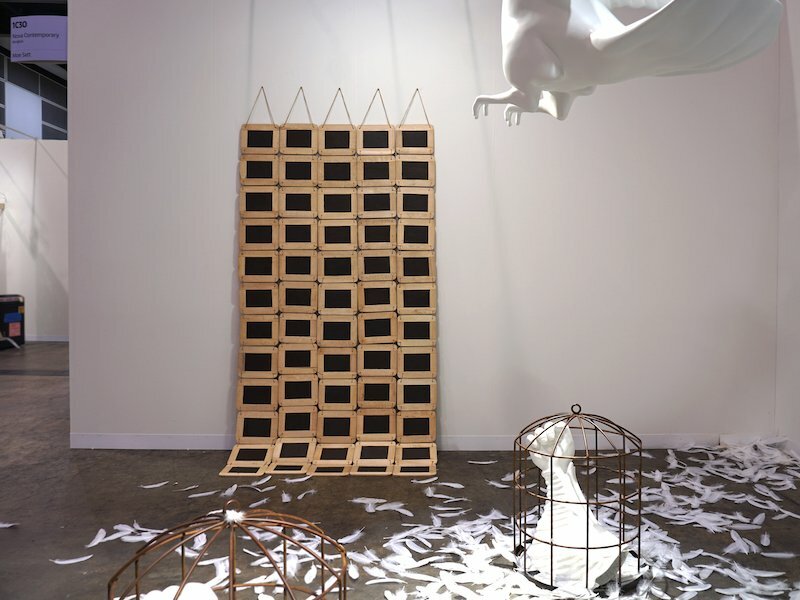 Dove with Revolution Hands (2018) features a white dove with clenched fists flying above two cages in which a single hand-wing are imprisoned in each cage. White feathers are spread on the floor, evidence of a struggle. The question – what is left from the uprisings? – is asked here. 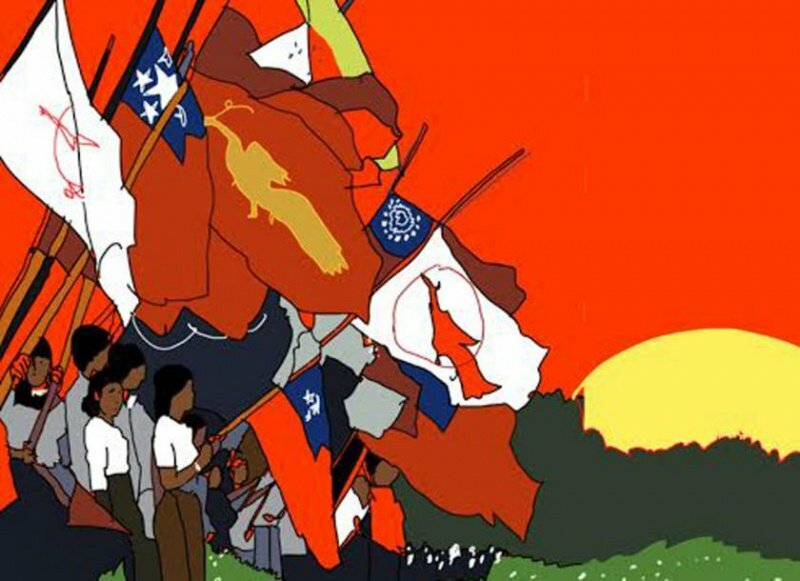 A more subtle artwork, not exhibited in Hong Kong, is the animation Collective memories from 88 uprising (2018). This was also created from an anonymous photograph found in an archive, featuring students. The students are either holding various flags for freedom and democracy, or the socialist flag held upside down. As Satt has no personal memory of the uprising, he combines collective memories with collaborative works to reflect on the event. The piece consists of an animated video and color version of the photograph. Only the flags are moving to a piece of original music, which was based on a famous song that the protestors sang to give themselves energy, especially during long hunger strikes. It was later used by the party of Aung San Suu Kyi, which emerged from the uprisings, and is sung (in the animation) by a choir from a music school in Yangon. The animation is paradoxically very serene. It reveals the students’ resistance, as well as the strength of their faith in possible political change. An unusual representation of the protests, Satt does like to provide surprising perspectives on history. 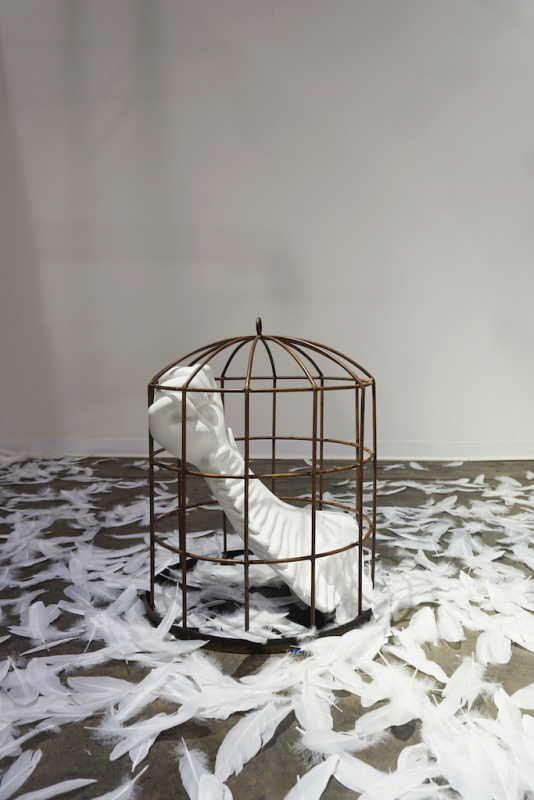 In Yangon, alongside the animation, there was an installation called Don’t Give Me Ar Lue (2018) that reminded viewers of the artist’s cynical spirit. It featured a pile of potatoes topped by a neon sign, saying: ‘Don’t Give Me Ar Lue.’ Ar lue means potatoes in Burmese language but it also signifies ‘crap’, so Don’t Give Me Crap would be a direct way to confront the promises that have not been kept, and the lies told by the government. The installation, called Tin Pone Chay (Clean Slate), was shown in Hong Kong and is the smaller version of a larger installation that was created for his solo exhibition, for which the artist collected and assembled 500 school blackboards, which were placed side by side and left blank. The erasure of the writing on the boards could be read as the consequences of a weak education system, a global ignorance of history, and as a metaphor for the prevalence of censorship, despite its official cessation in 2012. More interestingly, it opens up the possibility of a temporal and voluntary erasure of the past. For Satt, it would be positive indeed to erase the past and move forward in order to rebuild the country. He feels that oblivion could lead to the return of peace. However, forgetting does not mean forgiving, and, so far, the junta has not apologized for the arrests, tortures and murders that were committed in 1988. The idea of reconciliation has already been illustrated by Satt’s 2015 installation at the Rockbund Museum in Shanghai, where he installed 15 traditional Burmese wood and silk umbrellas whose fabric had been cut and repaired by zippers. On the one hand, we have oblivion, on the other, the need for the construction of a collective memory. It has been a few years now since Satt has been sharing pieces of Burmese history with the public through his lecture-performances, a content-driven format that he feels is more adapted to the country’s current situation. For example, by mixing his own memory with elements that he has found in books during his research into history, the artist relates how the design of the Burmese banknotes has evolved according to the whim of the generals in power. After 1988, the figure of General Ang San was replaced by a lion under the order of General Than Shwe, whose choices were mainly driven by his astrological beliefs and numerology. 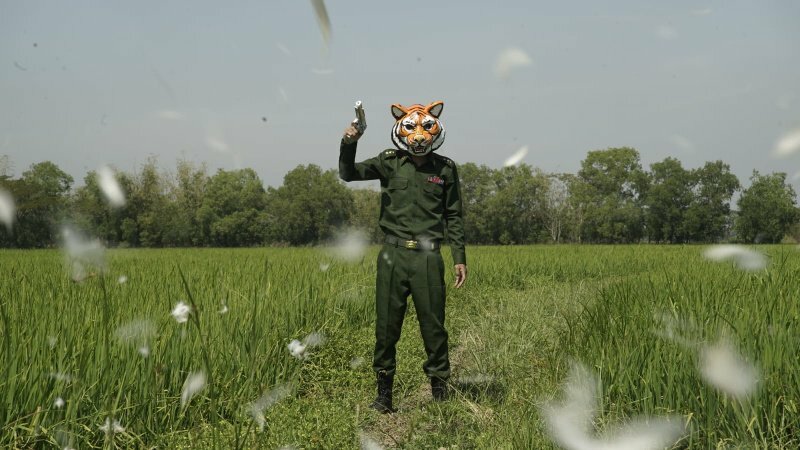 Satt’s long interest in the language of signs and hand gestures is at play in the short video, Bo/Kyar/Thanat (Captain/Tiger/Gun) (2018), whose title refers to a Burmese game that is similar to ‘rock, paper, scissors’. The work alludes to the current system of power and its legitimacy, trough symbolizing the captain, tiger and gun be as the strongest elements of the world (human, animal, object). Satt, who is performing with a tiger’s mask, waves the toy gun. This masquerade becomes more meaningful once we know that the video has been shot in front of the abandoned building where the Burmese Constitution was drafted. Despite some democratic elections, the power of the military is indeed secured by the 2008 Constitution, which guarantees military appointees take 25 percent of the country’s parliamentary seats. 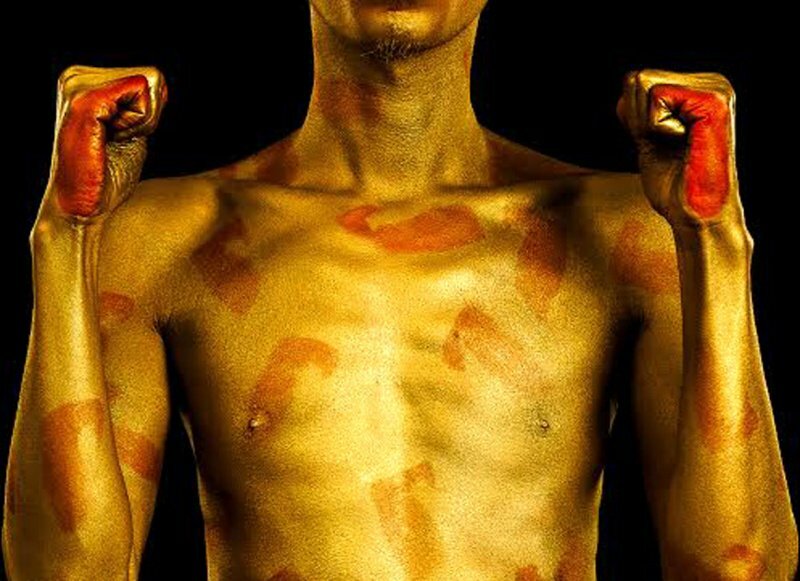 “Free but polite” is the artist’s motto when asked about his own freedom of speech. Moe Satt does not take himself too seriously, but the questions he is raises are fundamental in this transitional period when past revolutions are assessed in line with today’s political deadlocks and controversies. Caroline Ha Thuc is a French Hong Kong based art writer and curator. Specialized in Asian contemporary art, she contributes to different magazines such as ArtPress in France and Artomity/Am Post in Hong Kong. Prior to moving to Hong Kong, Ha Thuc spent two years in Tokyo and published Nouvel Art Contemporain Japonais (Nouvelles Editions Scala 2012) about the post-Murakami Japanese art scene. Her book Contemporary Art in Hong Kong (Asia One, 2013), which was first published in France (Nouvelles Editions Scala, 2013) provides essential keys to apprehend the city’s vibrant contemporary landscape and exposes the countless links between art, history, culture and identity. She recently published a book about Chinese contemporary art analysing the interactions between the art scene and China’s rapidly changing society (After 2000 : Contemporary Art in China published in French language Nouvelles Editions Scala, France 2014 & MIP, Hong Kong 2015 for the English and comprehensive version). As a curator, she focuses on promoting dialogue between artists from different cultures, while reflecting on social and political contemporary issues. Her recent exhibitions include Radiance (French May, Hong Kong, 2014), Hong Kong Bestiary (Platform China, Hong Kong, 2014), Shelters of Resistance an in-situ installation by Kacey Wong in the courtyard of the City Hall (YIA Art Fair Paris, 2015), The Human Body : Measure and Norms (Blindspot Gallery, Hong Kong, 2015) and Carnival (Hong Kong February 2017). She is on the International Curatorial Advisory Board of the Open Sky Gallery in Hong Kong and curated the 5th Large-scale Urban Media Arts Festival, 2016.